Barbecue Master: And while I was grilling . . .
And while I was grilling . . . While I was busy thinking about outdoor cooking, my mom was hard at work making Raggedy Andy and Ann for a family friend. 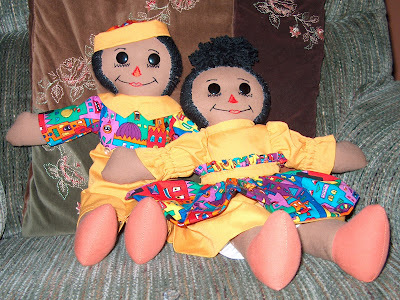 Mom has made rag dolls as far back as I can remember. My set is in lavendar. I made one Raggedy Ann, but it took FOREVER. I don't have that much patience. So, I stick with grilling and smoking. It does take time to make great food, but it's not as tedious as trying to get poly-fill in the arms of little doll babies. Did anyone suggest me a sort of BBQ aphrodisiac recipe for San Valentines Day?? Anything on the grill is HOT. Just keep it simple, so you'll have time for romance.